My bundt pan and I don't get along. I'm willing to take the blame for that; I'm just not meticulous enough to care about greasing properly, combined with whatever messy cake forces have been against me whenever I've tried to use it (evidence here). When I got a request to make a "light" or low-calorie chocolate cake for a friend's birthday recently, I was a bit stumped. That is, until I opened my brand-new cookbook, the America's Test Kitchen Family Cookbook (companion to the ATK Baking book I've been raving about incessantly). When I got to the very last recipe in the book, I perked up: "Light Chocolate Bundt Cake"? Oh hi there, answer right in front of my face! The only problem was that it meant a head-on battle with my sworn enemy, the bundt pan. Well, I'm glad to say this time I was victorious. I did something a bit audacious and ignored the greasing instructions from the recipe. Instead, I used a baking spray that's worked really well for me lately (Crisco with Pillsbury Flour). Just doused the pan in it, and the cake slid out like a charm. Normally I would have made a glaze or dusted the cake with powdered sugar, but I had to wrap it up and brought it to its new home to be consumed (along with a bag of powdered sugar for dusting later) the next day. It smelled phenomenal though! I'm not quite sure what specifically makes this recipe "light," other than the relatively small amount of oil. Regardless, I'm a firm believer that you can't go wrong with an America's Test Kitchen Recipe. Just keep in mind that it's not going to taste *quite* as awesome as your average chock-full-o-butter cake, but it sure will look purdy! I'm making a truce with my bundt pan. 1. Adjust an oven rack to the lower-middle position and preheat oven to 350F. Grease pan thoroughly with baking spray so the entire surface is coated well. 2. Combine chocolate, cocoa powder, and espresso powder in a medium bowl. Pour boiling water over the top, cover, and let stand until melted, about 5 minutes. Whisk the chocolate mixture until smooth, and set aside to cool slightly, about 2 minutes. While the chocolate is melting and cooling, whisk the flour, salt, and baking soda together. 3. Add brown sugar, oil, eggs, vanilla, and chocolate mixture to the bowl of a food processor, and process until smooth, about 1 minute. Pour the mixture into a large, wide bowl. Gently pour (or sift) half the flour mixture over the batter and gently whisk by hand. Repeat with the remaining flour mixture and continue to whisk until most of the lumps are gone. Do not overmix. 4. Pour the batter into the prepared pan. Wipe any drops of batter off the sides of the pan. Bake until a wooden skewer inserted in the center comes out with a few moist crumbs attached, 50-55 minutes. 5. Let the cake cool in the pan for about 10 minutes, then flip out onto a wire rack and cool completely, about 2 hours. Dust with powdered sugar or drizzle with glaze. beautiful! 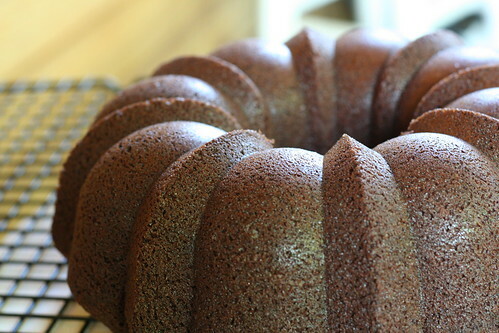 I love bundt pans and interestingly shaped cakes. 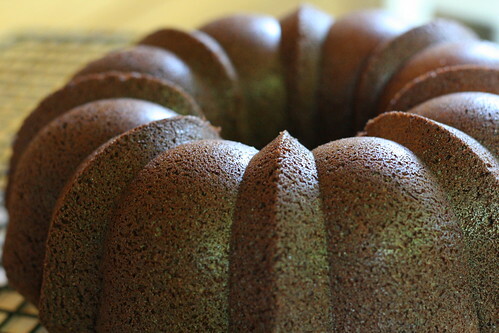 I use a spray from Williams Sonoma for all bundts, called Bak-klene. It's a all purpose no-stick baking spray that works like a charm. I confess.... I almost always use a cooking or baking spray instead of greasing or buttering my baking pan. I'm guilty of choosing to take the shortcut. But I just can't care if more seasoned bakers scoff at me - it works every time and nothing ever sticks. So there! I made this bundt before and loved it! I know what you mean about the lightness, but I think with ATK/CI, they like to make it lower in fat yet still flavourful. That's why I prefer their light recipes. Your bundt looks perfect. I actually never grease and luckily it comes out all the time. Maybe it's because I don't wash my pans in the dishwasher? Baker's Joy is a godsend. seriously. Those spray's w/ the flour are all I use on bundt pans, they work like a charm!!! And I actually only use those sprays for bundt pans, nothing else! No bundt pan enemy with those! I love CI/ ATK's recipe because I do believe they really do their homework Very Well and quite thoroughly to make sure all of their recipes will be almost fool-proof! As for the Bundt cake pan, like others, I simply used spray and slightly dust with flour, if needed. It truly works! this is what I needed 2 hours ago! We made a light cake that was so disappointing! Too gooey, terrible texture. Next time, this one! I just made this today... it was sort of okay (sort of flavorless and almost dry), but their Rich Chocolate Bundt Cake (Cooking for Two 2009) is just soooooooooooo good! When you're not looking for a light cake, I'd highly recommend it!